I’d jotted down The Forgotten Waltz on one or two reading lists, but I’d overlooked it until browsing the shelves at the Westport Public Library. When I cracked it open at home, I realized I’ve also read Anne Enright’s The Gathering, which was a bleak examination of family and marriage set around a funeral. We’re light years away from Maeve Binchy here (both are Irish authors) in terms of suffering and selfishness. There’s also wit and wisdom, to be sure—but with Enright, it’s rueful rather than cheerful. 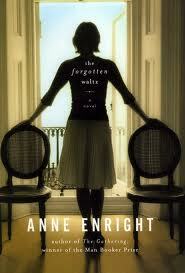 In The Forgotten Waltz, Enright follows the course of an illicit affair that, in turn, follows the recent crest and tumble of the Irish economy. In the early scenes, everyone’s buying houses, in the city, in the country, by the sea, and abroad; by the end, one couple must keep replacing their house’s For Sale sign, so it doesn’t look too dated. The novel has its flaws: a confusing shuffling of narrative time, a first-person narrator who can narrate another’s experiences much too omnisciently. But it was also a compelling story that I started on a Friday night and finished by Saturday night.